Of all of the rich fairy-tale collections that exist in countries throughout the world, few are better known than those gathered almost two centuries ago by a pair of German brothers—Jacob and Wilhelm Grimm—in their Children’s Stories and Household Tales, first published in 1812. Endlessly recast and reimagined in poetry and prose, on the screen and onstage, these stories are forever etched in our imagination. 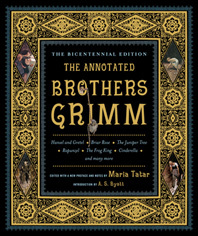 Here, in this bicentennial edition of The Annotated Brothers Grimm, Maria Tatar presents these timeless stories in a sumptuous and visually powerful format that helps reshape our understanding of the Brothers Grimm. Drawing from the final authoritative version in the mid-nineteenth century, Tatar, an internationally recognized scholar in the field of folklore and children’s literature, has translated and provided commentary for more than fifty Grimm stories, judiciously selecting tales that resonate with modern audiences and reveal the broad thematic range of the Grimm canon. Readers young and old will encounter popular classics, including “Little Red Riding Hood,” “Cinderella,” “Snow White,” and “Rapunzel,” while discovering some of the lesser known yet equally captivating stories such as “Four Artful Brothers,” “The Water of Life,” and “The White Snake,” all new to this edition. Perhaps most noteworthy is Tatar’s decision to include tales excised from later editions, including a number of “adult” stories that were removed once the Grimms realized that parents were reading the stories to children. Tatar’s own translations are accompanied by insightful annotations that search for origins, uncover cultural complexities, and explore psychological effects. Nearly two hundred images of exquisite beauty, many of them new to this edition—by artists such as George Cruikshank, Gustave Doré, Kay Nielsen, and Arthur Rackham—are reproduced alongside the stories. With a brilliant introductory essay by A. S. Byatt, along with the Grimms’ original prefaces to their editions, a collection of reminiscences about “The Magic of Fairy Tales,” and essays on the lives of the Brothers Grimm and the cultural impact of their tales, The Annotated Brothers Grimm captures the magical appeal of the tales while also unlocking their potent mysteries. In the tradition of Bruno Bettelheim’s The Uses of Enchantment, this volume shows how the Grimms’ fairy tales animate our imaginations and remain with us long after we have put them aside. 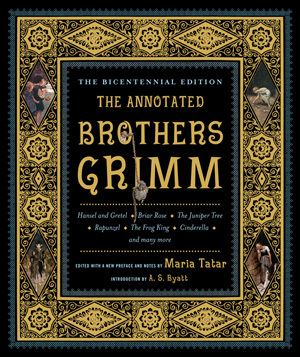 The Bicentennial Edition of The Annotated Brothers Grimm offers a treasury of cultural lore and wisdom that has been passed on from one generation to the next.